Best Beginning’s Baby Buddy app, funded through Reaching Communities, launched last month with a wealth of support behind the app. The app is also being piloted in three of our A Better Start areas: Bradford, Nottingham and Lambeth. 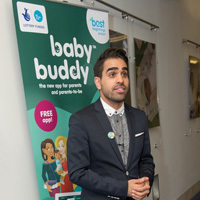 I’ve been working with the charity Best Beginnings on the development of the free Baby Buddy app for some time now, and was excited to be at the official launch on 19th November! Baby Buddy is a pioneering example of the future of pregnancy and parenting support. It acts just like a ‘digital best friend’! Not only does it give the user useful tips and help anytime they want it, it also acts as a digital companion, helping you navigate the sometimes confusing world of parenting. When you open the app, not only does it look stunning, it immediately draws you in and asks you to create a character of your own design to become your “buddy”, perhaps in the image of a trusted face you know or someone you’ve made up, who acts as your point-of-contact. Immediately, it becomes personal to the user: by using some basic information, the app refers to you individually, mentioning you by name, your partner – if you have one – and your baby by name. Furthermore, the information presented is from trusted experts, so you don’t have to worry about whether it’s reliable. You can store your appointments, look things up, create and keep track of goals, watch videos of common queries, and even ask your own questions! And in the officially launched version, there will be local listings of services and places for parents, as well as the “Bump Booth” and “Bump Book” which are diaries for thoughts, feeling and photos that can even be shared online if people want to do that. It’s a really rich all-round experience. Soft-launched in July, Baby Buddy is accessible through smart phones. Made possible through Big Lottery funding, it’s unique in many ways – especially so because it has been developed with input from a host of professional organisations and royal colleges, including the the Royal College of Paediatrics and Child Health, the Royal College of Midwives, the Royal College of Obstetricians and Gynaecologists, the Community Practitioners and Health Visitors Association and the Institute of Health Visiting and the Royal College of Speech and Language Therapists. All of these organizations have officially endorsed Baby Buddy, as has the Department of Health. On top of that, it’s had a great deal of input from young parents, which means it’s not only useful, it’s also engaging and fun! There is a growing range of health and wellbeing apps out there, but this isn’t just any old app – it’s going to become a routine part of everyone’s care. Best Beginnings, the parenting charity behind it, are working at a grass-roots level with local health authorities and multi-disciplinary staff to embed it in care pathways. As part of its national distribution and active embedding into care pathways, there are a range of free leaflets and posters available for healthcare professionals, as well as training available to use the app – more information is available for professionals. Best Beginnings have already sent out over 38,000 leaflets and 2000 posters to professionals across the UK. What’s critical about a healthcare intervention like this is the rigor behind its creation. Besides the content scrutiny and the engaging user experience, feedback has been sought from professionals and parents throughout its creation. In fact it will be continually sought as the app will be iteratively developed and improved over time. Best Beginnings are able to draw on anonymised in-app data to gain valuable insights on how different types of user use and rate the app, as well as feedback on the local services promoted within it. The charity can create bespoke reports for commissioners looking at uptake, usage and feedback in a locality. It’s this sort of holistic approach which will make a difference for projects like this: large scale take-up which won’t just help users, but is genuinely positioned to increase appropriate use of services and also gather insights to support service development. It’s a win-win situation. Above all, what apps like Baby Buddy can really excel at is reaching out to people who want and need support but don’t know how to access it, particularly young people. Those who work with young people and families on a daily basis will know how difficult it can be for them to get the information they need in a way that is relevant – especially when it comes to pregnancy and parenting. If we want to engage traditionally hard-to-reach audiences, then we have to start thinking out of the box and embracing new platforms. At a basic level, when it comes to our health and wellbeing, we all want information and support we can count on. Technology can play a powerful supporting role, providing accurate information in a friendly and non-judgmental way. But an app like Baby Buddy isn’t designed to be instead of friends, partners or healthcare professionals. On the contrary, it’s actively encouraging users to make and keep appointments and to make the most out of the social and professional support around them, to help them maximise their own health and wellbeing and that of their child. Download the Baby Buddy app for free now! Watch a promotional video featuring young parents and professionals explaining why they think Baby Buddy is so important. Watch a film which explains the embedding process for the app. Great to hear… thanks for sharing!